Coast-to-Boise railroad project dies in the Cascades in 1890s, when company goes bankrupt. T. Egenton Hogg had a dream of constructing a railroad from the Pacific Coast to the Atlantic seaboard with the line passing over the Santiam Pass. His exuberance did not match the practical vision, and although the project did begin in the 1880s, it never materialized. In 1871, Hogg began promoting his grand trunk line which was to go from Yaquina Bay on the Oregon Coast to Boise City, where it would connect with other transcontinental lines. The venture became known by various names and included the Willamette Valley and Coast, the Corvallis and Eastern, and the Oregon Pacific. He managed to persuade Eastern investors to back his plans. During the 1880s, 143 miles of rails were laid from Yaquina to within 12 miles of the Santiam summit. Financial problems continued to set back construction, and lenders were beginning to be concerned and threatened to stop funding the scheme. The first train from Yaquina to Corvallis traveled the tracks in March of 1885. Contracts were let in 1887 to extend the rail line to the summit of the Cascades, but funds had run out by the time the tracks had reached Idahna. The anticipated revenue from the railroad was not developing. Hogg recognized that, and in an effort to sooth investors, he jumped ahead on the line and started constructing a short segment of the railroad at the summit in 1888. His rights called for operating a train over the pass. In an innovative effort to meet the terms, he blasted a 100-yard grade over the summit and laid tracks. They were not connected to any line on either side of the pass. He had a small boxcar hauled in pieces to the summit and reassembled. He annually would draw the boxcar back and forth over the length of track by mules. In this manner, he claimed to meet the requirements of his rights. Unfortunately, his company went bankrupt, and in 1893, Hogg was removed as receiver. The line was foreclosed upon and was offered at sheriff's auction seven times before it was finally absorbed by the Southern Pacific. The railroad line was never completed as Hogg had envisioned. 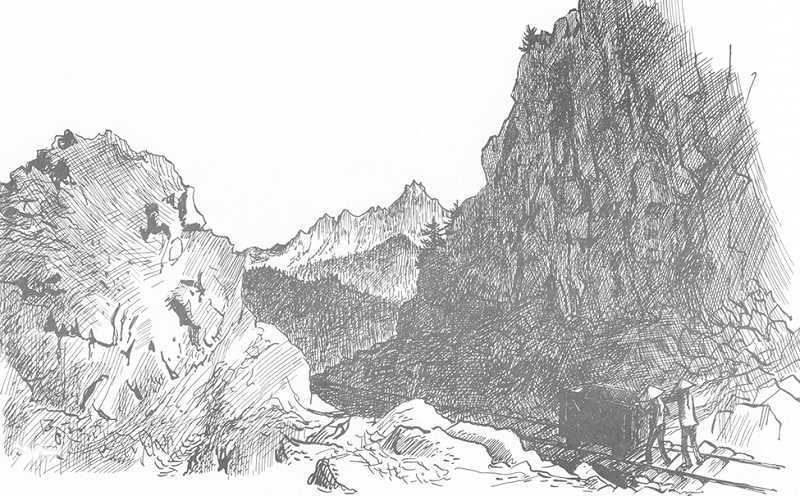 The site of the very short line railroad at the summit was known as Hogg Pass for several years before it was officially named Santiam Pass. A large rock bluff just west of the summit is known as Hogg Rock and is a symbol of Hogg's grandiose plans. There is a historical road marker along Highway 20 just west of the Santiam Summit that commemorates the site of the short railroad segment at the summit. The cut bank is still visible, and one can only imagine the folly of witnessing a boxcar being drawn back and forth over the short segment of rail line with no other connections.